I never liked any coleslaw growing up besides my grandma’s. She made the absolute best “traditional” coleslaw, hands down. It was creamy, but not watery or too wet, and had the perfect amount of tang and sweetness. I can only recall helping her make it once, and it was so long ago, that I have a minimal memory of what went in it. Unfortunately for me, and now you, she passed away almost three years ago, and I have yet to perfect it. 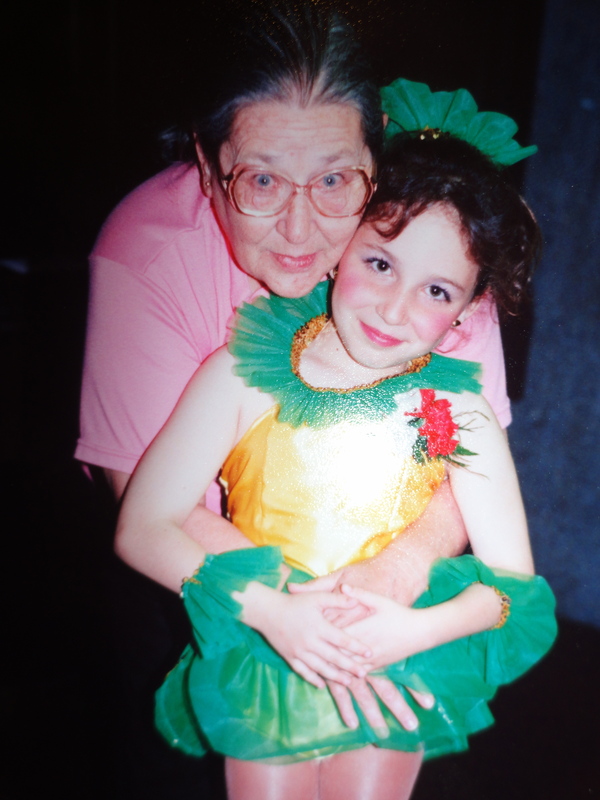 Here is one of my favorite photos of my Grammie and me. That being said, I’m not sharing her recipe with you today. 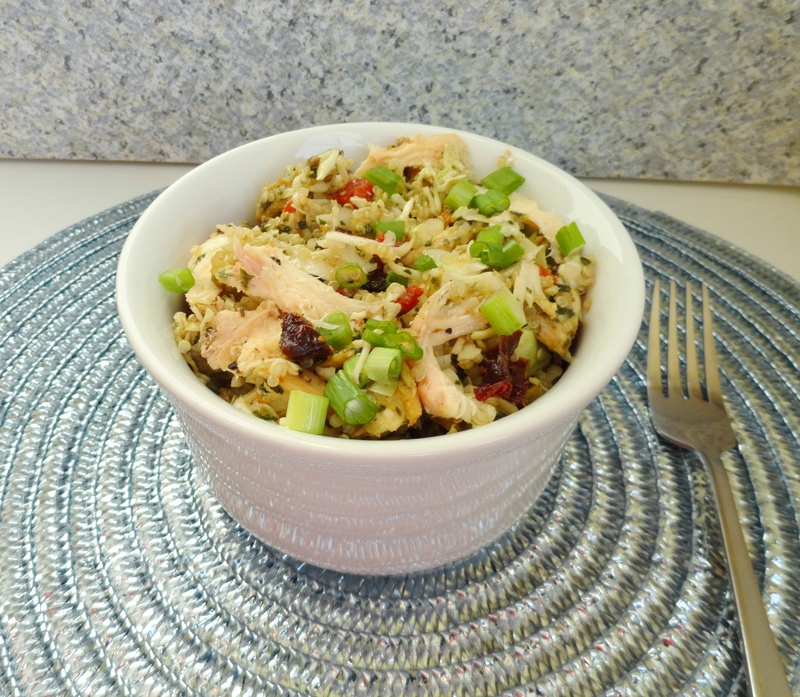 What I am sharing is a super delicious recipe from Nicole of Prevention RD. I was in search of a “traditional” coleslaw to serve with my slow cooker pulled pork sandwiches on my cooking board, when someone suggested her bacon coleslaw. It seemed close enough to Grammie’s recipe, so I thought I’d give it whirl. When throwing this together before my fantasy draft, among doing several other things at precisely the same time, I sort of forgot about measurements. Instead of purchasing the pre-shredded bags of cabbage or coleslaw mix, I grabbed two heads of cabbage, one purple and one green. I shredded up half of the green before realizing I was about to have a cabbage situation on my hands. Not to be out-done, half of the purple was shredded too. I followed the other measurements of Nicole’s recipe, and only added as much cabbage as necessary to use up the dressing. Over the last few days, I’ve been adding more and more – you know how it seems to get soggy after a few days? Adding more shredded cabbage kept the coleslaw crisp and fresh tasting. The slaw was great (though not as good as grandma’s)! However, I felt that the bacon kind of went unnoticed. I may use more next time, or thicker, better quality bacon. When you did get a bite of the bacon, it was excellent! 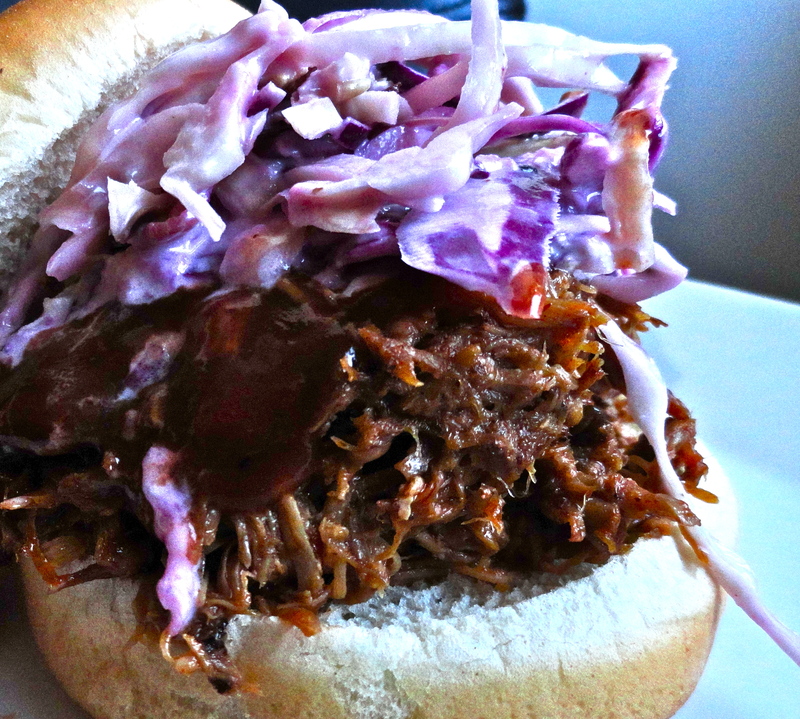 I served this along side of my slow cooker pulled pork sandwiches, and don’t be afraid to put it right on top of your sandwich. What a great combination!? 1. 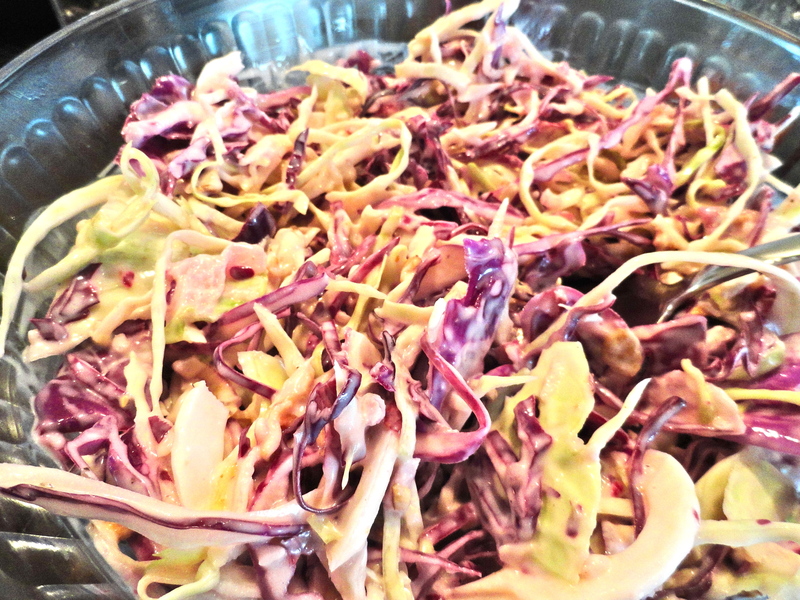 In a large bowl, combine cabbage or coleslaw mix and minced onion. In a medium-sized bowl, mix together salt, pepper, vinegar, mayonnaise and sugar. 2. Adding a little at a time, stir dressing into the vegetable mixture until dressed as desired. Fold in crumbled bacon. refrigerate for at least 2 hours before serving, allowing flavors to develop.